The DJM-600 provides a visual confirmation of a track's tempo to allow the user to merge one song into another smoothly. Also, BPMs of tracks that are difficult to measure can be manually input by tapping on the TAP button. If set to the Stand-By mode when no sound is present, the function automatically starts and stops recording in response to the presence and absence of the input signal and achieves the correct sampling with perfect timing. What's more, the user can edit the end position, making possible a wide diversity of playback effects by making use of three playback mode options and the cross fader start. Plays back the recorded sound once only when the button is being pressed. Plays back the recorded sound repeatedly when the button is pressed. Extends or shortens the recorded sound in accordance with the mixed track's BPM and plays back the sound repeatedly. Linked to BPM, the DJM-600 can add effects to each CH, MIC and MASTER independently. 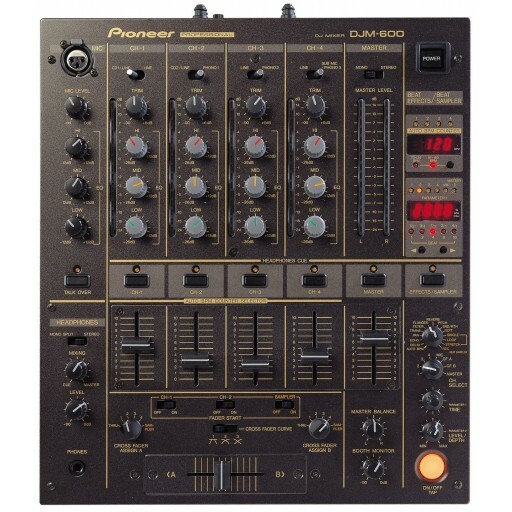 The user can produce music that makes full use of high-level DJ techniques by performing quick setting with the Beat Unit Switch button, adjusting the precise time parameters, or controlling the balance between the effect sounds and the original sounds by varying the mix ratio. Moreover, even when using the fader, it is possible to leave just the effect sounds without linking to BPM. Repeats a sound once. The user can set the delay to their desired tempo. Repeats a sound several times. The user can set the echo sound to their desired tempo. Automatically shifts the sound to the right and left. Also capable of short auto pan sequences that would be impossible via manual operation. Periodically varies the sound color. Periodically reproduces a sound effect resembling a jet airplane ascending and descending. Reproduces a reverberating sound effect. Allows the interval to be freely varied throughout a range of +/-1 octave. With this, the user can compensate for interval changes when using analog turntables or for tempo changes when different makers' CD players are used. Additionally, choruses can be made by employing mix ratios. Allows the user to connect the mixer to an external effector or sampler, etc. When the Headphone Output switch is set to MONO SPLIT, the right channel becomes the master and the left channel becomes the CH sound. Choosing Plural with the headphone cue, the user can also hear mixed sound. Moreover, this function can perform right and left level adjustment, thereby making monitoring easier. Connected to the CDJ Series, the DJM-600 can begin playback of a track using the sliding cross fader or the channel fader. It can mix tracks without creating spaces by setting the stand-by track's cue point and performing a single-action cut-in. Since it returns to the cue point via the back fader alone, sampler-style playback is also possible. Start/back play of sources recorded using the built-in sampler is also possible using the cross fader. The DJM-600 is equipped with a separate HI/MID/LOW 3-band equalizer for each channel. This arrangement allows the stress of the instrument sounds to be adjusted within the range -26dB to +12dBfor an improvement of about 100% (Pioneer comparison) in sound extraction. CROSS FADER CURVE: Choose from three types of cross fader start-up option. TALK OVER: Mutes -14db all levels apart from the microphone. PEAK LEVEL METER: Allows the user to instantly determine the source input condition for each channel to make possible certain operation without loss time. TRIM: Track input level composition is available. This function is compatible with diverse sound sources. INDEPENDENT MONITOR SWITCH: Enables independent or simultaneous monitoring of each CH, MIC, MASTER and EFFECT. BOOTH MONITOR OUTPUT: Utilizing independent output terminals for booth monitor use, this function allows the sound volume to be independently controlled at the upper surface. All faders, knobs, volume controls, buttons, etc., are made to professional-grade SS-use high-durability specifications and designed to stand up to hard use.